What you wear on your wrist isn’t as sensitive to seasonal shifts as your clothes. But that’s not to say men’s watches don’t move with the times. Trends in the world of horology – albeit changing at a pace that’s glacial compared to that of fashion – are still a thing. And while we’ll have to sit tight until SIHH in January and Baselworld later in March to scoop the biggest stories in timekeeping, there are clues as to what we’ll be in for when watchmakers finally reveal the cards they’ve been keeping close to their chest. So, we hit up our top sources on timepieces to bring you the trends ticking towards us for 2016. Engraving’s old hat. Until now, customising your timepiece might have meant having your name etched onto it, but things are about to get a lot more personal in 2016. “There is an emerging trend for customisation of design and colour of watch straps and dials, ” says Paul Sweetenham, co-founder of new British watch label Farer. Farer, whose watches start from £340 and are designed in the UK but assembled in Switzerland, is the latest in a series of brands (that also includes British watchmakers Shore Projects) producing pared-back designs with interchangeable straps – from Milanese mesh in classic black, silver and gold to silicone styles in neon brights. Personalisation is proving popular at the higher end of the market, too. Bamford Watch Department, the Mayfair-based brainchild of George Bamford, will even tinker with your top-tier timepieces – changing the colour of a Rolex Submariner’s watch face or a TAG Heuer Monaco’s chrono markers – so you can ensure your watch is truly your own. Remember that trend for watches so big they’d double as your dinner plate? Well, it’s dead. Much like oversized belt buckles, watches that look like they’re on steroids are the cringe-inducing accessory of choice for men desperately trying to make up for shortfalls elsewhere. Chalk it up to the fallout from the late noughties’ economic collapse (some say Swiss watchmakers slimmed down their wares at the time in order to appeal to the then booming Chinese market, ultimately discovering smaller isn’t necessarily lesser) or pin it on the changing face of 21st century masculinity, but 2015 was the year small watches hit the big time – from Seiko’s anniversary edition 1967 62GS automatic (just 37.6mm in diameter) to Timex for J.Crew’s exceptionally slender vintage army field watch (36mm). And 2016 will likely see the trend continue: “A classic dial with traditional batons, a slim case and a leather strap is bang on trend for 2016, ” says Matthew Rowell, UK Brand Manager at 88 Rue du Rhone. Says Fazal: “It’s a lot more polished than P. Diddy these days.” And if 2015’s releases – including H. Moser & Cie’s Endeavour Perpetual Calendar and Patek Philippe’s Calatrava Pilot Travel Time Re. 5524 – are anything to go by, she’s not wrong. With Google Glass’ release deemed a spectacular #fail earlier this year and initial response to the Apple Watch tepid at best, you’d be forgiven for thinking the future of wearables really wasn’t that bright after all. But TAG Heuer, the 155-year-old Swiss luxury watchmaker known for its pioneering precision, is shining the light with its new Connected smartwatch. Although launched back in November, the Connected, made in collaboration with Intel, won’t drop in stores UK-side until early 2016 and demand for this tech-enhanced timepiece is already eclipsing any of its smartwatch predecessors: “We’ve already sold out on pre-order allocations, ” says Fazal. Built on the latest release of Android Wear (and also iOS compatible), the entirely digital-faced Connected offers access to thousands of apps, is equipped with directional wind and weather monitoring, and features a vast array of micro-applications including alarm and stopwatch features. But that’s not all – it looks good too: boasting silver lacquer-engraved lettering, fine-brushed titanium lugs and a black, sandblasted, carbide-coated titanium bezel. “Digital partnerships are the ones to watch, ” says Damian Otwinowski, Retail Director for London Flagships of Watches of Switzerland. “In 2016, we’ll hear more about innovation, but I also forecast a lot of reinventions of what is already well established within watchmaking.” Watch this space. “Universal Genève’s outstanding timepieces from the 1960s and 1970s are inspiring many of today’s watch brands, ” says Sweetenham. 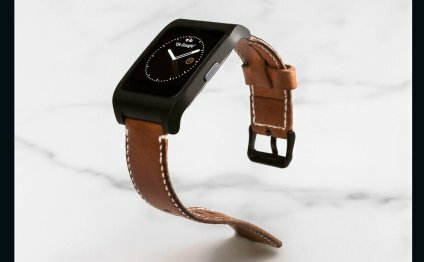 “Watch design that’s modern, classic and effortless [is trending for 2016], and new Scottish watch brand NOMAD brings watches back to basics with modern flair, ” say Holt and Powell. It’s worth bearing in mind that while some trends boom at the lower end of the watch market, some will (understandably) be slower to take hold in the boardrooms of luxury watch’s biggest players. And that’s if they ever do at all – some fine watches, after all, are pretty much trendproof.